Since February my post on Twitter powered subtitles for BBC iPlayer has remained in my top 5 posts and I’ve been meaning to revisit the iPlayer platform with another twitter subtitle example. 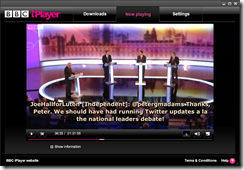 The general election ‘Leaders Debates’ seemed like an ideal event to experiment with the format. It became very apparent after the first debate that simply pulling the public timeline into the twitter subtitle generator wouldn’t work as with an average of ~30 tweets per second the public discussion would just be a blur. With the increasing popularity of twitter (and other social platforms) to comment on live events there is probably a separate research strand looking at intelligent filters, instead I’ve gone for a more basic approach. Fortunately the good people at tweetminster.co.uk, who have been closely monitoring the election using twitter sentiment, were able to provide me with a data file of twitter comments made by MPs and party prospective parliamentary candidates being tracked on twitter during the debate. Using the Convert time stamped data to timed-text (XML) subtitle format using Google Spreadsheet Script I was able to generate a subtitle file compatible with BBC iPlayer. Below is a short demonstration of the twitter subtitles in action followed by instructions to see the entire debate. The broadcast you download from iPlayer will be stored in a folder (something like My Documents] > [My Videos] > [BBC iPlayer] > [repository] > [b00s6lf7]), locate this folder and replace the file ‘b00s6lf7_live.xml’ with this one (keeping the obscure file name ie b00s6lf7_live.xml. When you replay the broadcast turn subtitles by clicking the ‘S’ button to see the tweets. Why not instead use as the principle of selection ‘number of followers’? Hi Rupert, Usually when I create subtitle files from Twitter I just display everything, but as I mentioned in the post, the volume of tweets was too great. The data provided by Tweetminster does include comments from Independents and other parties, which was a relief because I didn’t want to be seen to favour the main parties (in fact I think a number of tweets from your twitter account are included in the subtitle ;-). I think to allow people to replay the debate (or other TV programmes), with greater personal choice a over the information channels they see is definitely something for the future and is becoming a necessity as more people share their thoughts/reflections/frustrations over live events in the backchannel.